Adrian Dominican Associates are women and men, at least 18 years of age—married, single, widowed or divorced—who make a non-vowed commitment to partner with the Adrian Dominican Sisters. Associates live in many parts of the United States and in the Dominican Republic, come from various ethnic and educational backgrounds, and have a variety of interests. While maintaining their own lifestyle and remaining financially independent, Associates participate in various spiritual, social, and ministerial experiences with the Sisters, as well as attending Congregational events. 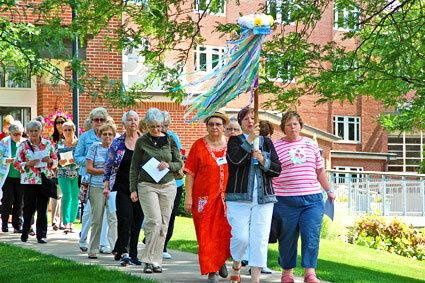 For nearly 30 years, women and men who seek spiritual enrichment, a dynamic faith community, and a way to help bring about change in the world have joined the Adrian Dominican Sisters as Associates. It is a way to live out the Dominican charism of seeking truth and preaching the Good News in a non-vowed commitment. Candidates for Associate Life undergo a period of formation, during which they study Dominican history and spirituality and come to know the Mission and Vision of the Adrian Dominican Sisters.